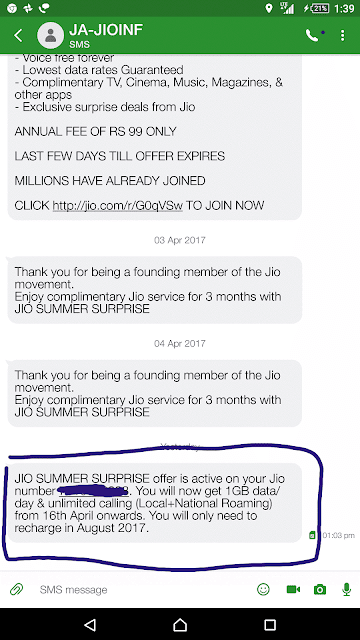 Have You Received Summer Surprise Offer Confirmation SMS for Your Jio Number? Jio's summer surprise offer is applicable for all Jio Prime customers who has recharged for Rs.303 and above. If you have recharged and wondering what's the status of summer surprise offer, it's the right time to confirm. All the Jio prime members who applied for summer surprise offer started receiving confirmation SMS. 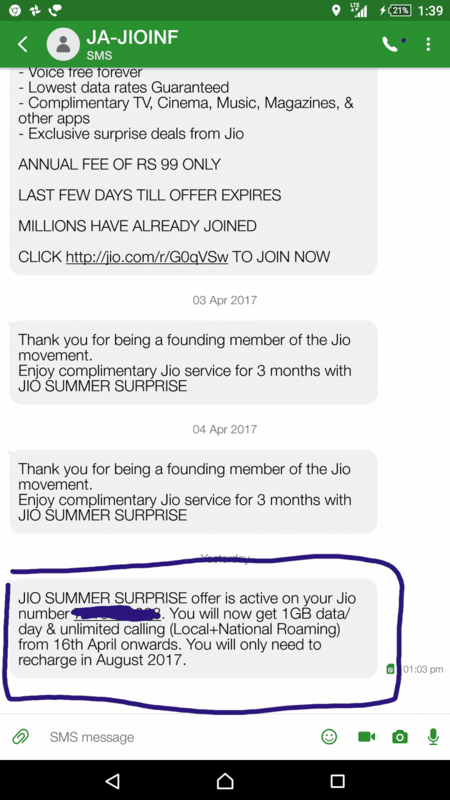 The confirmation SMS contains the information on when the summer surprise offer begins and when you need to recharge your Jio service. JIO SUMMER SURPRISE offer is active on your Jio number 7010xxxxxx. You will now get 1GB data/day & unlimited calling (Local+National Roaming) from 16th April onwards. You will only need to recharge in August 2017. I Did Not Receive The SMS Confirmation. What Should I Do? First, confirm whether you have done the recharge for prime membership for Rs.99. To confirm your prime membership is active, open your myjio app and log in. The dashboard will say Prime Member. Next, check the recharge amount you have done. Any recharge done for a value less than Rs.303 is not applicable. If you have done recharge for 303 and above, You may receive the confirmation SMS soon. Maybe on or before 15th April. Also ensure that the messaging client on your phone is Jio4GVoice. If you are using the default messaging client, the SMS might not be delivered to you. Just open the Jio4GVoice App on your phone. If it is not the default SMS client, a notification will show in the top. Tap on it. The Jio4gVoice App wil be used for sending and receiving SMS. If you still have doubt, use the Jiocare option on your myjio app and contact the Jio Support team. They will be the right person to check and troubleshoot the issues related to it.